so sublime: borsht has it all. Borsht was what we made to celebrate the founding of our love. Our first dispute: should garlic be allowed to ravish borsht? but you said yes; two heads went in the purple pot…. new twist on old favorites. it was my way of saying thank you from the heart. but now you’ve let the purple in. she’s seen me grow beets, stew beets, turn my heels and leave old beets behind. our sacred purple pots of beetroot soup. 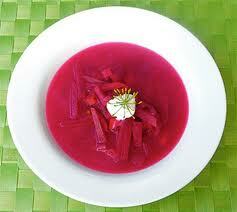 Growing up, “borsht” days were always special. We all had to wear bibs before indulging in this most delicious fare — because beets stain! One day when I was in elementary school, we came home to find that the pressure cooker lid had exploded — and the visuals were fantastic. Later in life, I made borsht on three personally momentous occasions: at the beginning of a deep love relationship, after my (future) husband studied the Bible with me, and in honor of a very close friend who was visiting my home for the first time in 30 years. Rich, purple, and delicious — like the best of life.